A few weeks ago, a friend and co-worker of Mrs MuddyJ’s, whom we will nickname R2,(not a Star Wars Reference) told me he had a pair of Vibram Five Finger’s that just didn’t seem to fit him, and if I wanted them, I could have them. I would just have to pick them up by running the Gruene 10k with him! Never one to accept an expensive freebie, I offered him a pair of Juaraches in trade, which he wholeheartedly accepted. I waited too long to register online, so I wound up driving all the way out to Anytime Fitness in New Braunfels. Although I could have registered and done my packet pick-up on race day, I am never a fan of race day pick-ups…and it was $30 on Friday, $35 on Saturday morning, so I wound up with a Venti Soy White Chocolate Mocha (at 140 degrees) as well as a race packet! Hoo-Ray Starbucks! I packed my race bag, albeit lightly (due to the fact I’d not be getting muddy!) the night before, set-up my bib on my shorts and laid out my EisenHOTTER! shirt to carry-on my traditional T-shirt swap. Since my once-beloved MotoACTV turned out to be an epic failure, I have gone back to relying on my previously purchased Gaiam Touch Heart Rate monitor. I woke up early on Saturday morning. The race was set to kick off at 0800 hrs, so I planned on getting there by 0700 and killing some time… It’s always easier to kill time then it is to find it! Finding the venue (the middle of Gruene, Texas) was easy, and there was a large and well-staffed parking area across the street from the start/finish line. I parked my Z and put up the top. I grabbed a handful of Halls cough drops (I had been suffering the ill effects of the ever deceitful and dreaded “summer-cold”, that’s the LAST time I share a bowl of ice cream with thing #3) I headed across the lot to get to the starting area, Juaraches on my feet, in search of R2 and company…. it didn’t take long, because as soon as I got across the parking lot, I heard “Hey J!” …I turned and there was R2….that was easy! We fell into an easy pre-race chat as we walked…I assured him he didn’t have to stick with me, as I was going to take it easy for this race. I am still rehabbing my sore ankle! While crossing the street, a car pulled up in front of the announcer’s area, and the announcer asked for a few volunteers. R2 was heading into his packet pick-up, so I swaggered over to help. “There’s my BAREFOOT GUY” he announced…I had met him at packet pick-up the previous day, and we discussed all things running, within a few minutes…including my plans to run this particular race in my Birthday Shoes. I grabbed some coolers to bring them to another area, was thanked and found R2 had picked up his race packet. Time passed and we all headed towards the starting area. R2 headed towards the front of the pack while I, knowing this wouldn’t be my fastest ever 10k, slipped in somewhere around the middle. Everyone around me kept tossing me thumbs up after looking at my feet as I milled around, and some asked if I was actually going to run the whole thing! I fired up my Endomondo app on my cell phone, and started the music going in my Jaybird BT headphones. I was getting into my own little zone when I realized everyone had stopped moving, and a flag had risen at the front of the pack. A few jokes from the announcer and we were off…and running… I tried to stay aware of who was trying to pass me, and who was around me. I was actually more worried about having my feet stepped on by other runners than I was worried about stepping on other stuff! With the tunes a’rocking’, and my feet a’runnin’ I settled into a nice even 0930 (ish) pace and held my head high, smiling large for all the world to see. As we went passed the start/finish line, the announcer spotted me in the pack, glanced to be certain I wasn’t wearing shoes, and then announced to the crowd he was going to start a collection to buy me some shoes! 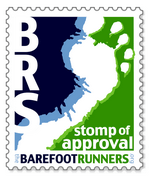 A good laugh was had by all, and many people were pointing in disbelief, shaking their heads, and then giving me a thumbs up…like no one has ever seen a barefoot runner before! A few quick turns later, and I was faced with THE DESCENT. I still have not quite gotten the hang of running down steep declines barefoot, so I just set my jaw and decided I would have to make it to the bottom without pitching forward or hurting my heels too badly. I started out with my feet churning wildly beneath me, but that started to feel like I was losing control, so I just let my body reflexively take control… I slowed, settled into an easier stride, and actually accelerated down the hill! At the bottom of the hill the course crossed a bridge, where R2’s family and non-running friends had set up to spectate. They hooted and hollered and I gave them a big cheesy smile and a thumbs up… almost to mile 3! I looked ahead, strategizing a bit for the course in front of me I could see, when I noticed a very welcome sight…a very long and VERY well manicured, yet slightly path worn strip of grass alongside the course…. a bare-footer’s dream surface… I nimbly hopped onto it after a few steps alongside it. It felt great! After almost three miles of pavement (of varying degrees of repair, mostly nice) the grass was very welcome! After an eternal few seconds of enjoyment of the new surface, I put the hammer down until I ran out of soft surface… hopping back onto the road, I settled back into an easy uphill pace and was handed a cup of water at the mile three water stop. After that hill crested, came every runner’s nightmare: The long and never-ending straight away… You know the type! Where the horizon starts to look further and further away with every step…Oddly, it was here that I started to really enjoy this run as I settled into my pace, rocking out with my tunes going in my headphones as I tooled along. At the end of the never-ending straight away, the course turned down another slight decline into another residential area… and there was R2! and man, he was moving fast! and 45 seconds later, was his buddy! A few turns and a water stop later, I was on the return trip, headed back up that same hill! This also gave me some real inspiration. It turned out I wasn’t doing nearly as poorly as I had thought I was! I was now headed back towards the start, and I was passing a lot of runners that were headed DOWN the hill…and this trend continued along the straight away, until I got just past the 3 mile water stop again, where the lead had passed me on his way back. halfway up the final hill, pictures don’t do it justice! The top of the hill turned and I was winded, but happy I had run flat out the whole way up… I emptied my gas tank on the final 200m or so and crossed the finish line: 01h00m42s! Just shy of the sub-hour I was hoping for! I grabbed a bottle of water and back down the hill I went to rejoin R2 and friends. By the time I got there, their last two runners were coming around the bend. We cheered them on and I ran up the hill again with one of them, coaching her on the way up…then back down again… we cheered all the other runner’s on as they passed, encouraging them to finish strong. I have the utmost respect for the guys and gals out there that run circles around me. To those seemingly immortal men AND women who run faster over long distances then I can hope to even touch while sprinting. I am always INSPIRED by the runners who finish LAST. My spirits are always lifted by the dogged and grim determination apparent in those men and women that are there to run for no one but themselves. My hat comes off to those who come in last, because I have been there. When “just finishing” is your only goal, and you give it your all! All in all, this was a great race, well put on. The volunteers were enthusiastic and plentiful, and I had a great time running this event. Can’t wait to do it again next year! 20th in my age group..not the best, but not the worst!